Yet again, infighting between the opponents of Syrian President Bashar al-Assad has played straight into his hands. On April 28, yet another violent chapter was opened in the slow-rolling collapse of the insurgency around the Syrian capital, in a region known as the East Ghouta. Early in 2016, this suburban-rural enclave broke apart in chaotic infighting, leaving hundreds of rebel combatants dead at the hands of their supposed brothers-in-arms and dividing the local insurgency neatly down the middle. The result was as predictable as it was disastrous for the insurgency: since then, Assad’s government has retaken around half of the enclave’s territory. A year later to the day, the rebels have returned to fighting amongst themselves. If the renewed internecine conflict between Islamist insurgent groups is not brought under control, it may well give the Syrian government what it needs to finally crush the last rebel enclave near Damascus. The fighting in April and May of last year involved three major insurgent groups or coalitions: the Islam Army, Failaq al-Rahman, and the Fustat Army, with the small local branch of an Islamist group known as Ahrar al-Sham mostly staying on the sidelines. For three years, the the Islam Army had been the dominant faction of the East Ghouta, waging a ruthless war against Assad’s government. It also enforced some semblance of order inside the enclave, albeit by brutal means such as an intrusive secret police, secret sharia tribunals, and torture. The dominance of a single faction brought basic stability and improved coordination among the insurgents, but the Islam Army’s high-handedness and harsh tactics were lamented by human rights activists (some of whom disappeared without a trace) and provoked considerable resentment among other rebel factions. On Christmas Day 2015, the Islam Army leader Zahran Alloush was killed in an airstrike—and instantly, the East Ghouta’s smaller factions ganged up on the weakened group to fill the resulting power vacuum. After a few months of rising tension and low-level skirmishing, the East Ghouta’s civil-war-within-the-civil-war began on April 28, 2016. The largest of the rival factions, a Free Syrian Army–flagged group known as Failaq al-Rahman, expelled Islam Army forces from the suburbs of Damascus and seized its smuggling tunnels, which it had used to bring in both weaponry and civilian goods. Failaq al-Rahman was aided in its attacks by the Fustat Army, a hastily assembled coalition between the local branch of al-Qaeda’s Nusra Front—now known as Tahrir al-Sham—and Fajr al-Umma, an opportunist faction living off of the smuggling trade in Harasta, a neighborhood on the northeastern end of the enclave. The division greatly facilitated the Syrian army’s offensives on the area. Assad’s forces initially focused on the south of the enclave, and then on its eastern edges, where the now-weakened Islam Army lost large swaths of agricultural terrain. Later, the government began to stage attacks into the Failaq al-Rahman-controlled Damascus suburbs to the west. In early 2017, the Assad government seemed to be getting ready to root out the rebellion east of Damascus, having just seized East Aleppo from rebels in the north of the country. Some local factions, including the Islam Army, were putting out feelers to Assad’s government or his Russian allies, apparently hoping to secure truces or probing the terms of a negotiated surrender. This sparked angry condemnations from the hardliners of Tahrir al-Sham, who say they reject such talks. “We refuse any reconciliations and truces that do not follow the rules of true Islam, which would return the revolutionary to being a slave of the criminal regime and stop the wheels of fighting and jihad against the criminals and tyrants,” I’m told by a Tahrir al-Sham spokesperson. In mid-February, government forces struck at the Barzeh and Qaboun suburbs northwest of the enclave, which are connected to the East Ghouta through tunnels that supply the enclave with arms as well as basic foodstuffs. The regime complemented its Qaboun-Barzeh offensive by shutting the sole remaining entry-point for food and civilian goods to the East Ghouta, a series of checkpoints known as the Wafideen Crossing through which a regime-connected businessman had been allowed to operate. For the rebels and for civilians in the area—the UN estimates that the East Ghouta is home to around 400,000 people—these moves have raised the stakes considerably. If both the Wafideen Crossing and the smuggling tunnels remain closed, the economic and humanitarian situation inside the East Ghouta will soon move from difficult to disastrous, potentially strangling the insurgency but at a terrifying cost to civilians. Seeking to prevent this, Failaq al-Rahman, Tahrir al-Sham, and Ahrar al-Sham launched a counteroffensive from the eastern Damascus neighborhood of Jobar toward Qaboun in mid-March. Spearheaded by Tahrir al-Sham suicide bombers who punctured army defenses, the insurgents made quick progress and nearly reached the Abbasiyeen Square in East Damascus, temporarily rattling the government. However, the offensive quickly stalled and the rebels were pushed back into Jobar, allowing the army to resume its offensive on Qaboun and Barzeh. Both areas are now slowly shrinking and will eventually fall. The collapse of the counteroffensive reflected poorly on the East Ghouta rebel leaders, who blamed each other along familiar lines of conflict. The Islam Army complained that it had not been allowed to send reinforcements, while Failaq al-Rahman and its allies said the Islam Army leaders had pretended to need their troops for a separate offensive, which never materialized. On April 28, one year after the 2016 fighting, violent clashes erupted between the Islam Army and Tahrir al-Sham in the East Damascus suburb of Erbeen. According to the Islam Army and sources friendly to it, Tahrir al-Sham had been harassing Islam Army members for months and, on April 28, a jihadi checkpoint kidnapped an Islam Army squad headed to the battles in Qaboun. In an interview through an online messaging service, Tahrir al-Sham’s director of media relations Emadeddine Mujahed called this story “completely false,” insisting that his faction has no checkpoints inside the East Ghouta—all its fighters were at the frontline. Abu Ammar Hawwa, an influential Islam Army-aligned salafi scholar in the East Ghouta, echoes that sentiment. “In my contacts with the Islam Army leadership, I have sensed a firm decision to end the presence of the Nusra Front completely in the East Ghouta,” he told me in an online interview. According to Hawwa, the Islam Army has suffered a long series of provocations from Tahrir al-Sham and the April 28 kidnapping in Erbeen was the final straw. He claims that local civilians want to see an end to the spread of “takfiri ideology” and accuses Tahrir al-Sham of provoking internal feuds that have lead to opposition defeats in many areas, including Aleppo. “All of these things make their presence in the area a danger that needs to be removed, not to mention the fact that they are classified as a terrorist movement, with all what that brings in terms of negative repercussions for the Ghouta in general,” Hawwa says. Unsurprisingly, Tahrir al-Sham has a very different view of what just happened. Emadeddine Mujahed describes the events of April 28 as an unprovoked attack on Tahrir al-Sham followed by arbitrary violence against local civilians. “After laying siege to our headquarters in Erbeen and Ashaari they began to summarily execute prisoners and to snipe at and kill passers-by from the general population,” he tells me. He also says the Islam Army is attacking all factions in the area, not just Tahrir al-Sham. Still, Failaq al-Rahman fighters have been drawn into the fighting and the group’s leaders scoff at the Islam Army’s conciliatory rhetoric. 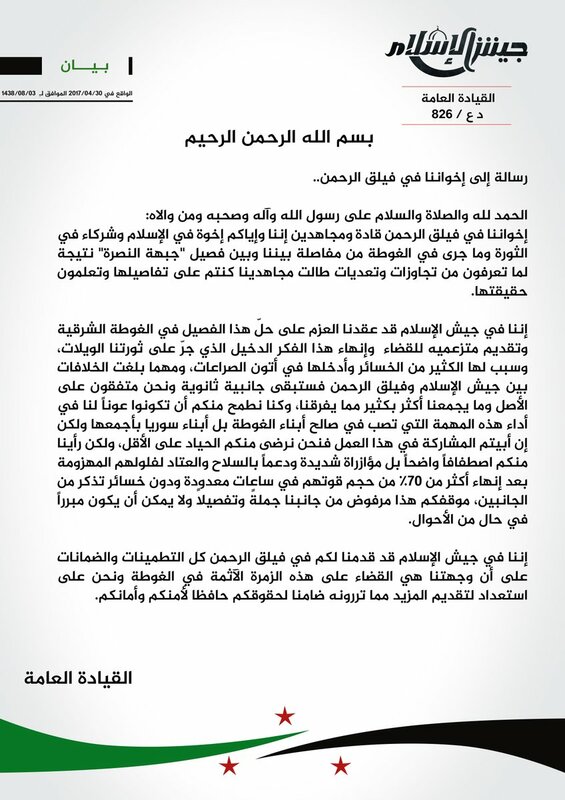 “What the Islam Army says to the media about signs of brotherhood and love and neutrality is misleading and deceptive,” claimed a Failaq al-Rahman statement sent to me by that group’s spokesperson, Wael Olwan. According to Failaq al-Rahman, the Islam Army had been planning its offensive for weeks and it was neither a response to provocations from Tahrir al-Sham, nor limited to attacking that group. 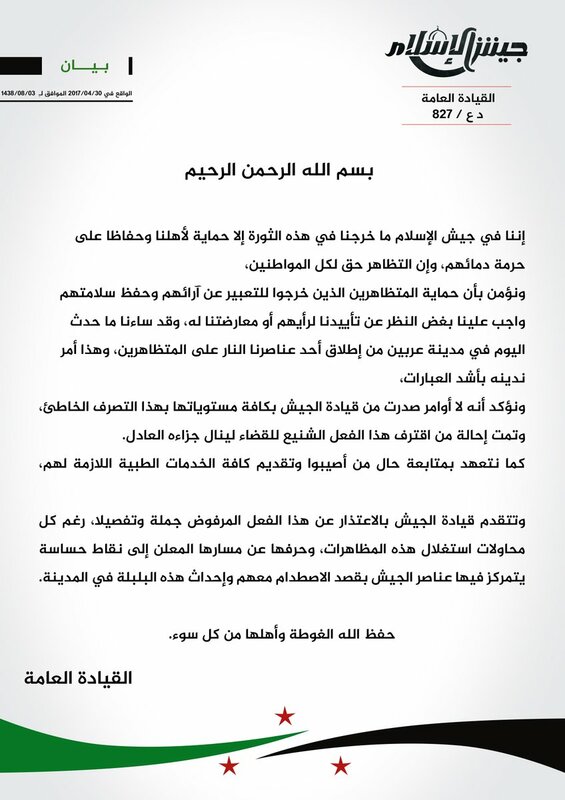 Failaq al-Rahman says it has lost “tens of martyrs” to the attacking Islam Army forces. The Islam Army also stands accused of firing on unarmed demonstrators that protested their actions in Erbeen and other neighborhoods. “When the civilians went out to demand that they cease that attack, they opened fire in the air,” says Alaa al-Ahmed, the activist. “That was on the second day. On the third day, the Islam Army used live bullets against civilians, wounding 13 of them.” Critics of the Islam Army have compared these actions with the way Assad’s forces put down demonstrations in 2011, and footage from the incident show demonstrators taunting the Islam Army soldiers with cries of “shabbiha,” a term of insult for pro-Assad militias. On April 30, the Islam Army issued a statement “condemning in the strongest of terms” the firing on a demonstration by one of its fighters, claiming that the group’s leaders had given no such order and that the man had now been arrested. “The army leadership apologizes for this absolutely unacceptable behavior,” the statement said. The rhetoric of the Eastern Ghouta rebel leaders is eerily similar to how they sounded in spring 2016. The difference this time is that the roles are reversed: now, the Islam Army claims to have struck back after months of provocations, while Failaq al-Rahman howls in protest at what it says was an unjustified assault and demands the return of captured property as a condition for peace. Peace between the rebels, that is. The wider war will go on and, just like in 2016, there is little doubt that the Assad regime will seek to exploit the opportunities presented. To government loyalists in Damascus, all factions of the East Ghouta are equally threatening and need to be destroyed, though many seem to hold a special hatred for the Islam Army, which launched thousands of mortar shells and rockets into Damascus over the past few years. Even if that is true, the rebel enclave remains under siege and in difficult circumstances. Recent losses in Qaboun and Barzeh and the closing of the Wafideen Crossing make the long-term future of the Ghouta insurgency look extremely bleak, with or without infighting. And, if the conflict in the Damascus suburbs is allowed to bloom into a 2016-style showdown between the two local giants, Failaq al-Rahman and the Islam Army, the East Ghouta insurgency may face disaster. The last time the East Ghouta insurgents fought for supremacy inside their besieged enclave, they lost half of all their territory to Assad. This time, the other half may be at stake. Cover Photo: Credit: A Failaq al-Rahman fighter in 2016. Source: Failaq al-Rahman website.